Selznick, B. (2007). The invention of Hugo Cabret: A novel in words and pictures. New York, NY: Scholastic Press. Brian Selznicks, The Invention of Hugo Cabret: A Novel in Words and Pictures combines text, illustrations that take place of text unlike other novels in which illustrations are meant to supplement the story, photographs from the time period, and still images from early motion pictures. These illustrations and images capture moments of suspense so as to place the reader into the setting beside the characters to engage with each mini climax and highly exciting plot point that occurs so as to heighten the story-reader experience. The main protagonist, Hugo, is a young boy orphaned after his father’s death in a museum fire and alone after his uncle the caretaker of the train station clocks disappears. Hugo continues to live in the train station doing the work of his uncle without the station inspector aware due to his fear of being sent to an orphanage and his desire to finish repairing a mechanical man (automaton) using his father’s journal detailing instructions. Hugo steals the mechanical parts he needs from a toymaker’s booth in the station, and when caught, the owner confiscates his notebook…his father’s notebook, and most prized possession. To earn back his notebook the old man has him work in the booth to repay what he stole. The toymaker’s goddaughter, Isabelle, wear a heart shaped key around her neck, the exact key Hugo needs to wind up his automaton. The two children after bringing the automaton to life set out to discover the true identity of her godfather who turns out to be much more than a bitter old toymaker. The Invention of Hugo Cabret: A Novel in Words and Pictures is a lively story, with resonating themes of secrets, dreams, and inventions that are woven throughout the entire story from Hugo, Isabelle, and Papa Georges (George Melies). This realistic fiction is centered greatly on the two children, Hugo and Isabelle who are entirely fictional, but George Melies and the automatons are indeed factual. Even the books conclusion with each progressing pictures showing a moon fading further away resonates true to the filmmaker George Melies who “realized that film had the power to capture dreams”. Those who enjoy building model toys, enjoy inventions, trains, film, artwork and even history will find The Invention of Hugo Cabretan enjoyable story riddled with many curiosities and a heartwarming story. 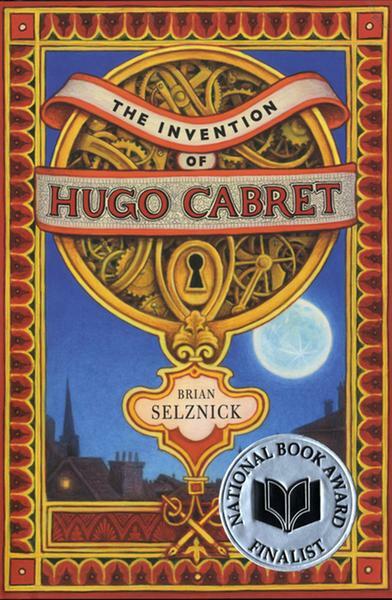 And Hugo (2012) film adaptation of this unique and award winning novel not only is fitting to the plot of the story but also adds one additional visual element to The Invention of Hugo Cabret, or rather the invention of Brian Selznick.